Hey guys, thought I would throw this out there to see if anyone else has been running into this issue. We’re running 3DSMax 2015 and TP6, and I’m getting a lot of stability issues and crashes, specifically when using volumebreaker. 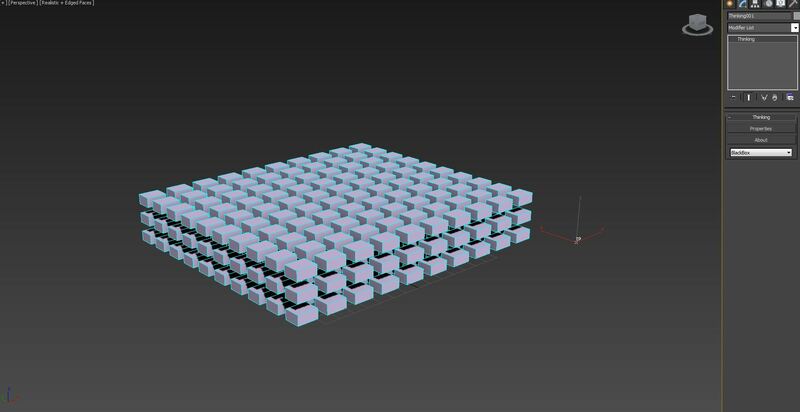 I have a simple scene setup, 300 boxes, brought in with an Obj2Particle. I Volume Break them in a new dynamic set with the default settings. I scrub forward a frame, then backward a frame to refresh it. Now if i select the TP node in the viewport, I lose pieces of the display. Sometime’s it will be the properties button under the stack (like the image below), other times I’ll lose the display of the entire TP interface. Here’s what my stack looks like when this happens. I ran this same simple setup in 2014 with no problems. How can I assign color or material to particle from another particle? I generate trails from particles and i want that trails have colors of particles that generate it. Base particles have geom instance node with materials. Add a shape material, under the material section for your trail particles. I don’t know. The hard way, is to put each particle base into a different group. hey guys, I’m trying to do two volume break operations - I got a scene where a sphere hits a wall - it break apart and pieces fall down onto the floor and break again when they hit the ground… First bit works perfectly with the Shape Collision node and using velocity threshold to turn on the volume breaker… however how can I do that second volume break when the pieces hits the ground? Group a is vb1 and group b is the floor, use all distance. Make sure your group hierarchy has the vb on top of floor group. In PPassAB node, make ‘A velocity’ visible on output. Connect ‘A particle’ to position intersect node. Connect ‘A velocity’ to direction intersect node. And, connect ‘B particle’ to particle shape on intersect node. For the second vb2 node. Have the particle input connect to PPassAB ‘A particle’. Then make the input ‘ON’ visible for the vb. 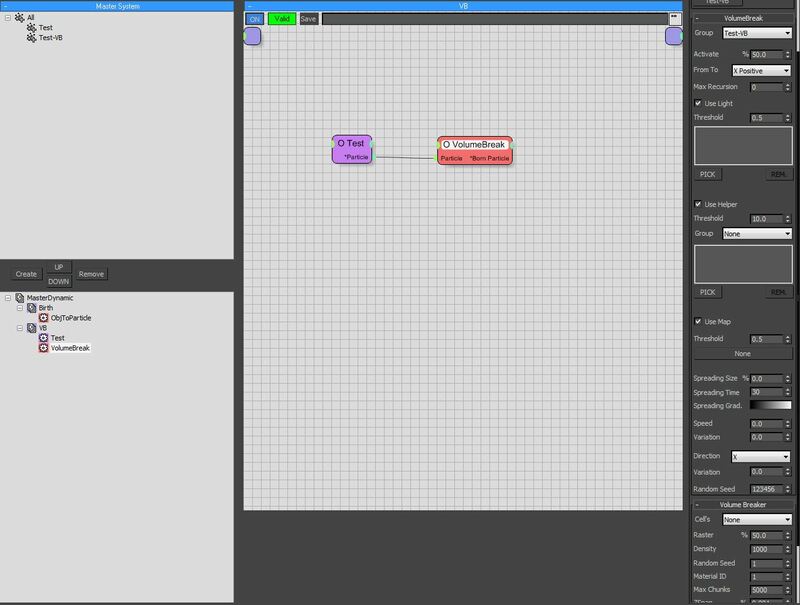 And the ‘ON’ connect it to the ‘hit’ output for intersect node. The intersect node. Check the ‘speed as ray length’. depending on the scale of your scene, adjust the input speed to maybe 1-10. Or play around with it until it works. Hi, i am just looking at tp6 and when I have an object falling to the ground collision environment it bounces, especially when I have two lots of volume breaks through cell activation. I want the object to look really heavy and shatter under its mass but it falls to the floor and breaks but takes a while to slowly fall over like it has a bend modifier from max on it. Particles also go through the floor, I’ve changed the vowel size but that doesn’t seem to stop it. It is mainly the particles from the second volume real that are already very close to the floor that go through. Hi all, I have to make a characters wich beggins to build from the bottom of his legs to the top of his head from little boxes (pictures) , from the buttom to the top gradually, the character is moving, and I dont know how to achieve that effect. the photos have to move to the surface, the effects should be easy, but the thing wich make it hard to me is that it should be gradually, not random. Anyone There to help me out. dunya101 - Have you tried attaching a noise controller to a float, and plugging that into a scale operator? I am assigned to “ImplisitShape” to the particle. I want to output a velocitypass in rendering in vray, but it is a color of the results. It does not work. Need help, Getting problem with self & ground collision. Your structure is off. Generators for particles, should be on top, this includes your cylinder, floor, and the particles to activate VB. And your SC and any forces should always be at the bottom. The reason is, TP reads the system from top to bottom. You needed more particles to have a better VB fracturing, so I increased it. And I increased the sampling from “Per Frame” to “Per HalfFrame”, you can find that in the MasterDynamic. That way the particles has enough time to collide. It looks like Will Wallace’s tut set up, he didn’t really explain these. I guarantee you, if you learn from Hristo, you’ll be able to solve your problems. And Hristo is usually on this forum, so if you have any questions, ask him. nmcelmury- thanks for your reply. I will try that and let you know. Got a TP question for everyone. I’m trying to sim a tree crashing down, and it proving to be a tricky thing to solve. So I know TP can handle the things like branches breaking as the tree hits the ground, but the parts of the sim I’m having issues with are the bouncy movements of the branches that didn’t break off, and then the cloth like movements of the leaves as the tree lies on the ground. I’ve tried a simple setup with breaking up the tree and adding sc joints, but even on a simple setup this proved to be problematic with no easy control of the joint behavior, and problems getting the correct mass into the sim movement. So I tried TP6 softbody and it had some promising results, but with no way of controlling the stiffness through maps, the whole tree was acting as a uniform softbody rather than as a falling tree would - i.e truck stiff and heavy, while the branches are flexible and are able to move. I’ve tried running a sim in Ncloth, but it produces an inflated bag type motion which is sort of what you’d expect from ncloth. So now I’m trying Houdini and its wire solver, which probably has the motion type I’m looking for, but is very slow even on a simple setup. That’s a tough one, ask the other pros. I took so long to respond, cuz I was trying to figure it out myself. thanks for giving it some thought.